Are you ready for a fabulous recipe for any brunch or breakfast because this one is a keeper, delicious and low in fat! 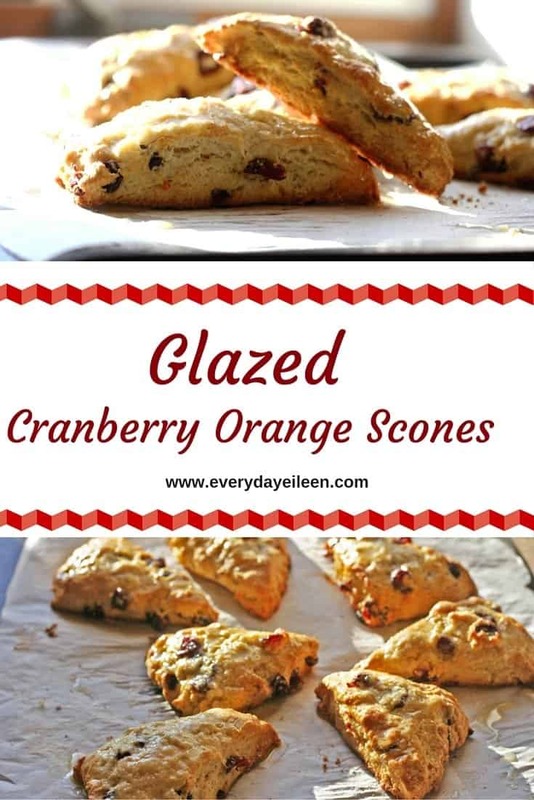 I am so excited to share this recipe today for Glazed Cranberry Orange Scones! As a child, on a trip to Ireland, everyday ( even then I was Everyday Eileen haha) I had scones with my breakfast and let me tell you, they were amazing! Since then, I have been making various types of scones for my family and friends! I love a good cup of tea and a scone and I am one happy girl! I especially love to share with you that I prepare these scones with lower fat ingredients like low-fat buttermilk and light butter which allows having a sweet treat without loading up on calories! I know, I know, that is always a wonderful thing! The beauty of baking scones is that they are so easy to prepare and so delicious. Scones are one of the first things my kids learned to bake, okay my youngest learned how to bake, the rest like to eat what I bake, but I am okay with that because they are my honest critics and I love them for making my recipes better! So you, yes you who thinks they cannot bake, this one is for you! Your family and friends will love these with brunch or a quick to-go weekday breakfast or snack! I suggest using parchment paper on your cookie sheet, easy clean-up! 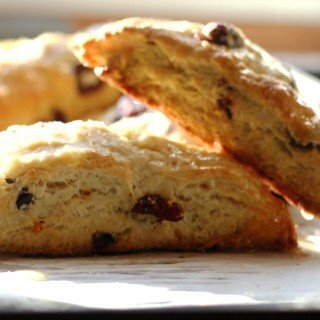 These scones are a delicious blend of cranberries and orange flavors. A perfect combination, my favorite pairing, just like my Cranberry Orange Smoothie! I top these scones with a little extra orange flavor with an orange glaze. These are lower in fat so a little glaze is a lovely treat! I really hope you make and enjoy this recipe, and if so, please share the love on Facebook, Pinterest, or your favorite way of relating to your friends and family, and please continue connecting with me on Instagram, Pinterest, Twitter, Bloglovin, Google Plus ! 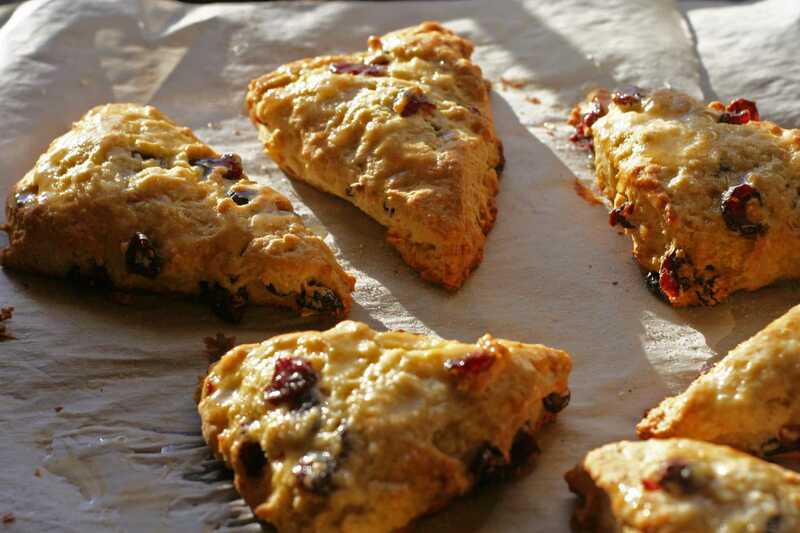 Low-fat and low-calorie delicious scones made with dried cranberries and orange zest. These scones have additional flavor with a light orange glaze. So easy to prepare and bake. Great served with jam or a little butter Great served at a brunch or an easy breakfast! In a bowl, sift dry ingredients - flour, sugar, baking soda, cream of tartar, and salt. Add in the orange zest. To the large bowl, add the light butter to the dry ingredients and blend with your hands until the flour mixture looks like a course meal. Add in the dried cranberries. In a separate small bowl, whisk low-fat buttermilk, lightly beaten egg, orange juice, and vanilla extract. Fold the wet mixture into the dry mix and combine, do not over mix the dough. Form into a ball. Turn the dough out onto a lightly floured work surface. Press into an 8 inch disk. Disk should be about 1/2 inch thick. Cut into 8 pieces. Arrange on the prepared cookie sheet. Using a pastry brush, brush scones with the 1 Tablespoon of buttermilk and sprinkle with the turbinado sugar. Bake for about 15 minutes and check scones for a golden brown color. While scones are baking, in a saucepan, over medium heat, add the orange juice and the confectioners sugar. whisk together to blend ingredients and set aside. Hi! I just made these today using some leftover cranberry-orange sauce from Thanksgiving. They turned out great! One note- on the Big Oven App the recipe is listed as having 3333 calories per serving! I clicked over to your site to see what in the world was in a scone with that many calories. Imagine my surprise when I saw you used lower calorie ingredients! Whew! They sounded so good and easy I made them right away. Thanks! Hi Janet! I am so glad you enjoyed the recipe and made these scones! They are one of my favorites! I will have to let the editors at Big Oven know of the error in the calorie count.. These are most definitely not a high calorie scone! I hope you continue making these and have a fabulous day! These look absolutely amazing. I like to bake, but I’ve never tried to make scones. Now I will. 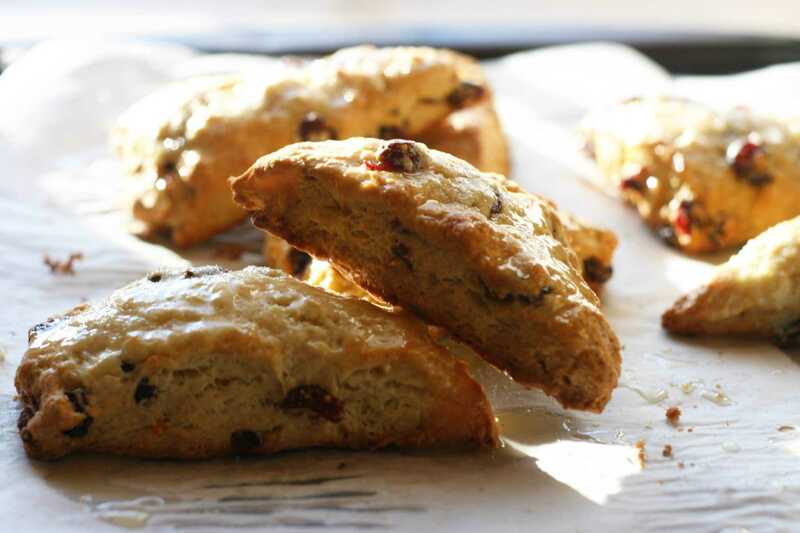 I have to admit that I have never made scones before but would indeed love to make these ones. The glazed cranberry orange scones recipe sounds delicious and they seem to be on the healthy side to me. Thanks for sharing the recipe. 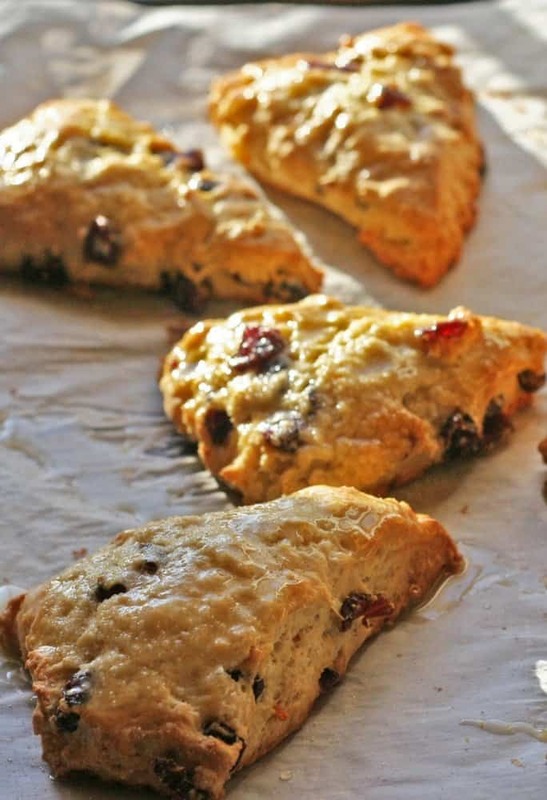 These would be a great first scone to prepare! Yes, they are healthier as I use low-fat buttermilk. I hope you give these a try! I absolutely love scones so this recipe will definitely be going on my to-make list! Thanks for sharing it! I’ve never made homemade scones before. Thank you for sharing this! I rarely think to make scones but everyone in my family loves them so much. I need to get out my baking bowl for this recipe! I didn’t realize these were so easy to make. I will have to try this. And the flavor combo sounds delicious! Yes Jen, so easy to prepare. I hope you enjoy! I love scones but I’ve never been bold enough to try baking my own! Maybe it’s time to give it a try! Super easy! I hope you enjoy and let me know how they work for you! Oh this is happening for our weekend brunch! My husband will love them! Wonderful! Enjoy the brunch and let me know how it worked for you! These look so tempting!! When we visited Europe they were a must for me! I’ve never tried making making them myself though. I love the combination of cranberry and orange! I usually have cranberry and orange muffin on the weekends as a treat. I think I will swith it up and try a cranberry orange sconce. uummm, I love scones. Never had cranberry and orange before. Will def try them. Great, I hope you enjoy as much as I do! My mom absolutely loves English scones! I am going to have to make these for her! Scones are so underrated in my opinion; these look amazing! I never would have thought to make orange flavored scones! I am so glad you enjoy the recipe. Let me know how it comes out for you! we love this one! What a delicious recipe indeed. It really looks yummy. I want to try these and for sure this is really worth to try. It has been at least 10 years since I’ve had scones. I enjoyed them with a cup of coffee. I have never made them before so I may have to soon give it a try. Cranberry and orange is one of my favorite flavor combos. These sound great! These scones sound delicious, and the light you have shining over them is lovely! C Cranberry and orange are my favorite fall fruits to pair together. I can’t get enough. These scones sound good with a cup of tea! Love scones! It seems like forever since we ate them last. Cooking them with cranberries sounds fantastic. Will definitely be trying this. Omg these scones look amazing!!!! So need to give your recipe a try! Maybe next week for brunch! These look amazing! I am planning a tea party in a couple of weeks, and I think these would be a delicious addition! That would be awesome. Let me know if you include on the menu for the tea! They are great made in advance too! I’m a big fan of scones, and when you add the glaze on top, they’re even better. These look amazing! These look really tasty. I will add them to my list of new bakes to try. I like my scones to be more like biscuits, less cakey. Just by looking at ingredients I think it should be right for me. I love making my own scones. Actually I prefer them from a local bakery but sadly they’re not gluten free. Your recipe looks delicious. You could swap out gluten free for this recipe quite easily! I have not tried to make scones, and yes I am one of those who does not have a lot of luck in baking things. I will share this recipe with my sister. She’s the guru in the family when it comes to baking. Dang, these look good! Am pinning them to my packed lunch board as I reckon they’d be perfect for taking to work! They would be perfect. I double the recipe because my family loves these for breakfast and a few to go! I hope you try with the glaze. they are delish! Great recipe! Truly awesome. So looking really delicious. These look great. I pinned this recipe to try for later. these look amazing! I don’t know what it is about cranberry & orange together but I love it! It’s definitely scone weather, these sound wonderful! I am glad you enjoy this recipe! I love having scones while drinking tea. This one sounds really yummy! Thanks for the recipe! These look so so delicious! This looks so delicious! Thank you for sharing. I’ve never tried to make scones before I’ll have to try it out! Great Amber, I hope you enjoy! I’ve never made scone before, but I think I’ll give it a try. They look so delicious! I’ve never mad scone before, but I think I’ll give it a try. They look so delicious! I could eat scones and a big cup of tea right now. Look delicious. I do hope you bake these and enjoy! Love tea and scones! I have never had a scone before. These looks super yummy though so I just may have to whip one up.